Sorry, you can only order up to 34 units of this product! Smarten up your bathroom or en-suite with this back to wall toilet. 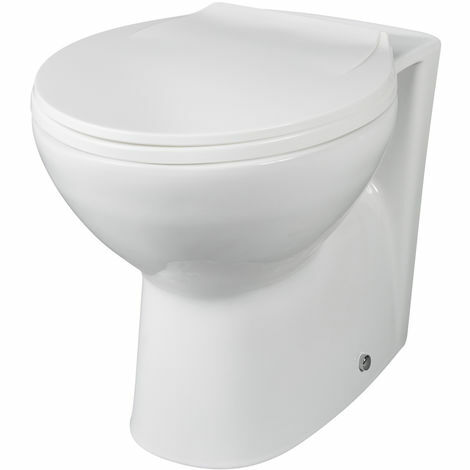 Featuring curved lines, this back to wall toilet comes complete with a soft close seat to minimise unwanted noise. Measuring 355mm in width and 520mm in depth, this back to wall toilet is suitable for use with WC furniture units, which conceal the cistern and pipework for a neater finish and easier cleaning. Please note: a concealed cistern and toilet pan fixings are not supplied. Features: Colour: white. Modern design. Includes soft close seat. Width: 355mm. Depth: 520mm. Height: 400mm.